We recently moved into a 1950s ranch house in southeastern Pennsylvania. One of the lease requirements was that I maintain the yard for this corner-lot. No problem, I thought. I don’t mind mowing grass, raking leaves, or shoveling snow. Heck, I even enjoy doing such mindless tasks. They force me out into Nature and give me time to think. I gleefully signed the contract. I didn’t notice one particular tree until a week or two later, when I literally stumbled onto its produce. Most of our backyard is fenced in. But along one outside edge, a four-foot wide strip of grass lies next to a locally-busy street. Leaves and other natural litter were merging into the roadway there. So on a nice afternoon, I grabbed a rake and a few bags dedicated for “yard waste” and headed out to clean up. That’s when I discovered that all of the leaves had five narrow fingers, and that they were surrounded by hundreds of spiky seed balls. All this scatter had come from one of our trees. The annoying balls were everywhere. Walking here felt like skating on quarter-sized pincushions. I gathered up three bags full of the offspring of that one lone tree. Then I went inside and checked my field guides. It was a sweetgum tree. I’d seen them once or twice before, but I’d never lived close to one. Two weeks later, after a long day of rain and wind, I was out there again. Those darn balls just kept on falling. I looked up. 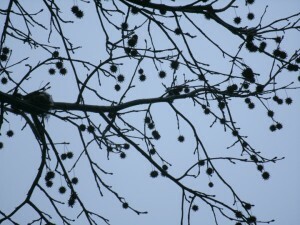 The sweetgum branches were leafless. But hundreds, if not thousands, of seed balls were still hanging on. I could see them silhouetted against the white winter sky. What a mess I was in for. Usually, I aim to keep an open mind when it comes to Nature and her bounty. But this seemed like a never-ending penance that I had unknowingly volunteered for. In desperation, I turned to Henry Thoreau’s journal to see what observations he might have had about the sweetgum. Unfortunately, these trees are not natives to Massachusetts. Thoreau encountered them only in the fall of 1856, when he was undertaking a surveying job in Perth Amboy, New Jersey. There the sweetgum trees were “very common and large, oak-like,” according to his journal entry for October 27. “The fruit was a coarse, rigid, spherical bur, an inch or more in diameter, which opened and dropped much fine seed in my trunk.” Henry had it good. He didn’t have to collect any sweetgum seeds himself, because the darned spiked casings fell right into his own open receptacle. And since he was just visiting, he didn’t have to clean up anything afterward. Lucky man. In sweetgum frustration, I looked online. The anonymous author of the Wikipedia entry was a kindred spirit: “The long-persisting fallen spiked fruits can be unpleasant to walk on; sweetgum is banned in some places for this reason. In abundance, they can leave a lawn lumpy.” No kidding. The neighbors who tip-toe along our part of the street can verify this. Some enterprising folks sell batches of sweetgum balls online, I discovered. Crafty people use them in projects consisting of natural elements, like holiday decorations or handmade wreaths. Hey, maybe money does grow on trees! I could just pack up these seeds and send them elsewhere. A benefit of the sweetgum finally appeared a few weeks later when a flock of colorful birds landed in our yard. 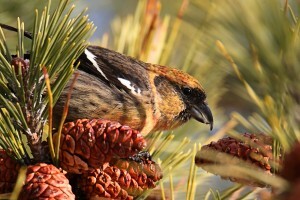 The males had red bodies, and the females were greenish. They ran around and picked ferociously at the sweetgum balls still left on the lawn. 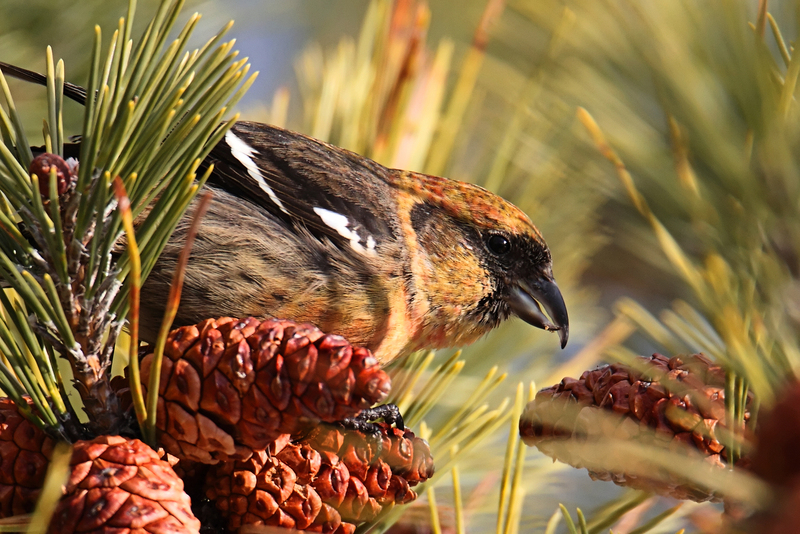 My guide book identified these birds as white-winged crossbills, which I had never seen before. I watched them for at least an hour in fascination. I guess the sweetgum tree has fans after all. And I guess I should leave some of the seed balls in the yard. Comments Off on Sweetgum Clean-up…Spring?